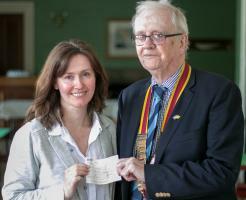 Rotary Club of Helensburgh - welcome! Please scroll/swipe down through this page to find out more about us, in addition to the pages linked in the menu, top-left. Alastair Wilson spoke about bread making in Chorleywood, Hertfordshire, and Ron Dunachie proposed the vote of thanks. 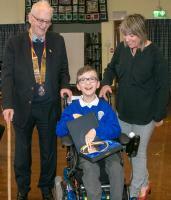 A Kilcreggan Primary School pupil has won a District 1230 award. The Young Writer/Young Photographer Awards Presentations ceremony was held in the Royal Northern and Clyde Yacht Club at Rhu. 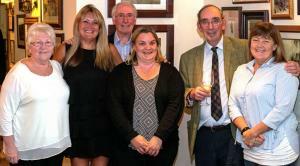 The annual Wine Tasting was held in the Commodore Hotel, Helensburgh, in aid of the local branch of ENABLE, and was staged again by Ellie's Cellar of East Princes Street. Some £600 was raised. This year's Schools Quiz was held at Cardross Primary School, whose team won the 2017 event. It was won by the Lomond School team, who then came close to winning the District 1230 final. 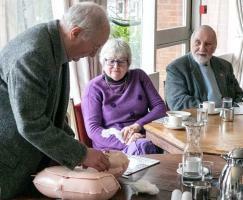 Graham Smith gave a demonstration of CPR on behalf of St John Scotland Dunbartonshire. Immediate past president Gordon Burgess (right) congratulates his successor, 2018-19 Helensburgh Rotary Club president Mike Jane. From left are junior vice-president Derek Hall and senior vice-president Douglas Dow. The Club Board will meet in the upstairs meeting room at the Yacht Club. The Secretary will read the Minutes of the April Board meeting. John McCormick is responsible for arranging the speaker or speaking himself, and Derek Hall for the vote of thanks. We meet on Tuesdays at 12.45 pm for 1 p.m.